This piece is part of Ting Yuen's "Sisterhood" series. I created this line as a tribute to my sisters, my girlfriends and to women all over the world. 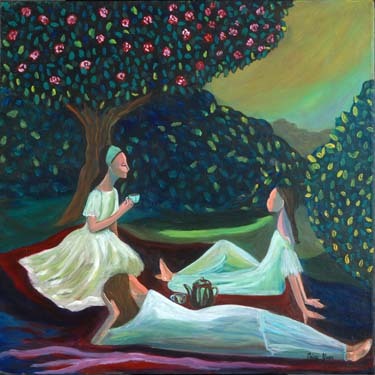 This painting is about conversations between sisters and girlfriends and the strong bond between women. Knowing that whatever is shared among the tea party will be kept confidential. It is always a beautiful afternoon when you are surrounded with your kindred spirits.